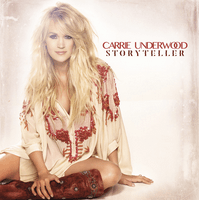 Carrie Underwood – ‘Storyteller’ Released Today! C2C 2016 headliner Carrie Underwood has today released her first album in 3 years, ‘Storyteller’! The album features 13 tracks, including the current single ‘Smoke Break’ as well as the 3 tracks which had already been released, ‘Heartbeat’, ‘Renegade Runaway’ and ‘What I Never Knew I Always Wanted’. Check out Carrie’s wonderful performance of ‘Heartbeat’ below and make sure you go and grab a copy, you won’t regret it!